If you can grill a pizza, why not a regular pie? 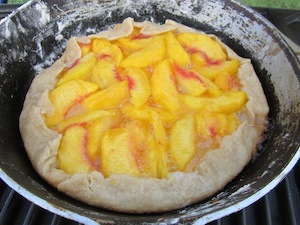 That was my goofy idea last week when peaches were plentiful and an outdoor cooking demo loomed. Here’s how my reasoning worked: The pizza I grilled on top of my stove last summer at a friend’s urging turned out great. So maybe I could do the same thing with peaches at the Copley Creekside Farmers’ Market, where the cooking equipment consisted of a propane burner and a gas grill. This time my goofy idea worked. Who knew? With a grill and a few peaches, you can make a terrific dessert. The bonus for those of us still living in the stone age without central air conditioning is that we don’t heat up the kitchen. Technically I made a galette, not a pie. That’s a French tart in which a layer or two of fruit is arranged on a circle of dough, and the edges folded toward the middle to hold in the fruit. Galettes usually are made free-form on a baking sheet. Because of the space constraints of a grill, I used an 8-inch cast-iron skillet. The grill at the market was propane, but the technique will work with charcoal, too. Just build a medium-low fire and use a grill with a lid. The heat can be managed by moving coals under or away from the skillet during baking. Other types of fruit may be used instead of peaches. Try this pie with blueberries, pears, plums or apples. The pie takes about 40 to 60 minutes to grill, depending on the heat of the fire and the thickness of the dough and fruit. It’s done when the fruit is soft and the pastry on top is flaky when you pinch off a smidge. In a lidded grill, build a medium-low charcoal fire or preheat gas grill to medium-low. Fit dough into a 7- or 8-inch cast-iron skillet. If you do not have a medium skillet, use two nested metal pie pans. In a bowl, toss peaches with sugar, flour and salt. Pour into pastry-lined skillet. Fold excess pastry around edges over the filling to make a 1 1/2-inch overlap. If using egg wash, brush on exposed pastry and sprinkle lightly with sugar. Place over medium-low coals, cover grill and cook for 30 to 50 minutes or until fruit is soft and crust is golden brown. Makes 1 pie. I’ve been freezing blueberries and blackberries like crazy for use all winter in my morning yogurt. Long ago I stopped freezing berries on cookie sheets, then transferring to freezer bags. The process, recommended by experts, ensures that the berries won’t stick together and freeze into a solid block. My simple methods works just as well. I wash the berries in a colander or sieve and spread on towels on my counter to dry for a couple of hours. When no moisture remains, I transfer to freezer bags and sprinkle with sugar (actually, Splenda), then freeze. Those who have limited freezer space or are just lazy like I am should try this method. When people ask if I miss my old job as food editor of the Beacon Journal, I always say “No,” but I’m lying. I miss the cookbooks. Just about every new cookbook crossed my desk, sent by publishers in hopes of a review. Now I’m reading other people’s reviews and salivating for a peek at books such as “Pok Pok” by Andy Ricker and “Pickles, Pigs and Whiskey” by John Currence. Those are two of the big fall cookbooks previewed in The Tasting Table this week. For a taste of the newsletter’s cookbook roundup, click here. And if you know any publishers, give them my new address. Can you tell us where you found Uncle Gizzy’s Hot Horseradish??? We have been unable to locate it. Dear P.M.: This is embarrassing. I have no memory of that brand, other than a vague familiarity with the name. Oops, I just checked the fridge, and there’s a jar in there. My guess is someone sent it to me. At any rate, I have no idea where you can buy it. Does anyone else? Do you know anywhere in the Akron area that might have cooking lessons for children? My grandson (age 11) has an interest in cooking and since I no longer live in Akron, I don’t get to spend the time I would like teaching him these things. I am just thinking something like the basics (measuring) or even a one-day class. If you have any ideas, please pass them along. As always, thanks for your help! Dear Michele: Occasional kids’ classes are held at Western Reserve School of Cooking in Hudson: https://www.wrsoc.com/kids-cooking/. Also try Linda’s Kitchen Bakery in Tallmadge, which occasionally offers baking classes for teen-agers: http://www.lindaskitcheninc.com/Directions.php. Please tell your friends about my Facebook page. A link to this newsletter is posted weekly on the site. And don’t forget about my new blog site, where you can find not only each week’s newsletter but archives of past newsletters and more and bigger photos.